Since our return from Brisbane environs we have been appreciating the peace and quiet at home as well as enjoying the wildlife around us. One of our large and prolifically fruiting Ficus benjamina has been providing food for a number of birds during the day as well as for Spectacled Fruit-bats during the hours of darkness. Well the daylight must have arrived a little earlier than this fellow expected or perhaps he was just too full to fly off – whatever the reason he didn’t seem bothered by our attention. Allen and I have both had the pleasure of rearing orphaned fruit-bats in past years and we’re very fond of them. 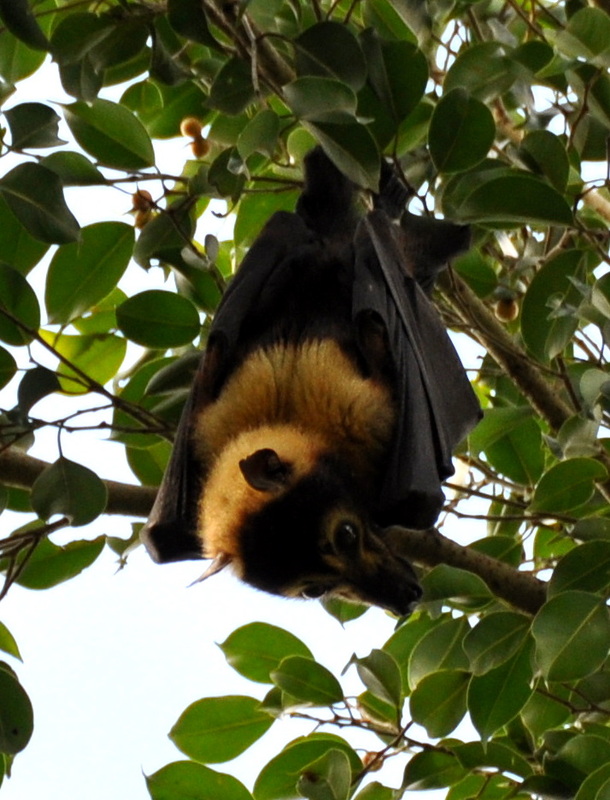 This entry was posted in Daintree Mammals and tagged Spectacled Fruit-bat. Bookmark the permalink.